Qeema Naan or Keema Naan is a popular flatbread available in Hyderabad, made with minced meat in a flaky parotta. In this vegetarian version, I have used minced soya granules and stuffed in a flaky flatbread, typical to the version popular in Hyderabad. I have often heard Hubby Dear mention this Keema Naan that he used to enjoy during his stay in Hyderabad many years ago. He has always been talking about how flaky and juicy the naan is. It’s called a naan though in resemblance it looks more like the parotta we get in the south. So when I was doing the AtoZ International Street Food, I had picked up a couple of dishes that needed minced meat and I wanted to replace it with soya granules. Toshka, a Damascus Sandwich and Nachos Supreme were two of the dishes that needed to be made using minced meat. I thought why not make it vegetarian by using soya granules. During the time I was planning to make, we had already decided on September theme and it suddenly struck me that I could make the Qeema Naan that is a Hyderabad special that hubby dear was always talking about. So you see, this was one dish that was cooked and clicked so many months before. I was very sure I wasn’t going to make it again. The dish was very good, though we are not big fan of soya chunks. 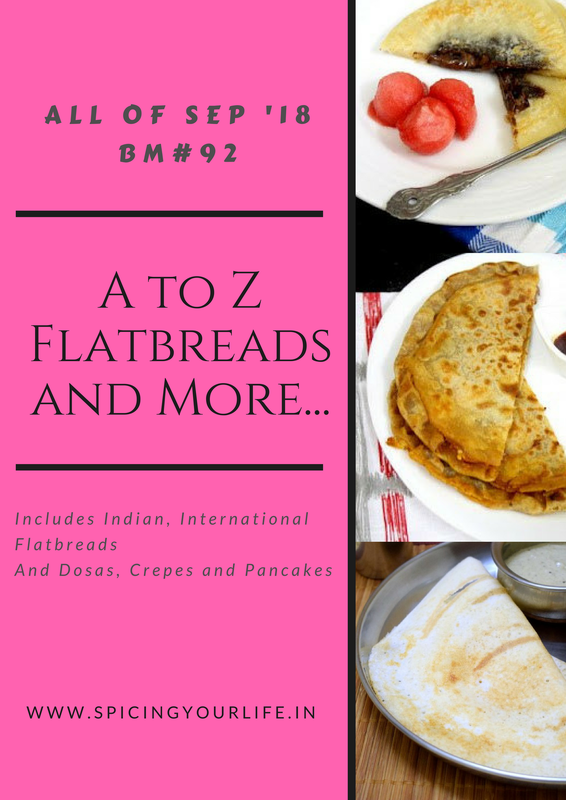 I was so glad that I had a dish for the Q in the AtoZ Flatbread and More, where I am doing AtoZ Indian Flatbreads. If you are keen on knowing whats for Q in Dosa Varieties, hop over! In a wide bowl, take all the ingredients and knead to soft dough. Bring a pot of water to boil along with turmeric and salt. Add soya granules and let it cook for a couple of minutes. Drain it in a colander for a while till all the water drains away. If required you can further squeeze to make the granules very dry. Heat a nonstick pan with oil, add bay leaf and then finely chopped onions. Saute well. Add the soya granules and saute till it becomes dry. Add all the spice powders and combine well. Combine all and simmer for 10 mins till the soya granules get cooked in masala well. Keep it aside. Pinch out equal balls from the dough, dust well and roll out. Take about 2 tbsp filling and spread in the center. Cook the naans on both sides over a hot tawa. Qeema naan ! Same pinch Valli . The right way to make a qeema naan is with soya , but since I am not a soya fan I made with Gobhi ka qeema . Perfectly made pocket parathas which are so authentic. That paratha looks yum Valli. I have a box full of soya granules and I was wondering what to do. This looks like a tasty way to get through it. So yummy! Soya makes an excellent stuffing for making naan. I would love to have this soya kheema naan without any side dish. Nutritious stuffing makes me hungry already. In Mombasa, minced meat filled chapati as its called is very popular as street food. Your preparation reminds me of the chapati. I don’t like soya, but perhaps would fill it with paneer. Wow at first I did though I of kheema in this and was searching and then got to know you replaced with soya granules. Interesting and innovative ideas must say. Wish I can make something to get over my inhibition for soya granules. The naan looks so good! Wow!You really plan your post so much in advance!! I am not of soy granules but my daughter loved it! These parathas would be her favorite for sure!